Palestinian Prisoners’ Club (PPC) said yesterday that female Palestinian writer Lama Khater is being harshly investigated inside the Israeli prison of Ashkelon, Quds Press reported. The PPC placed responsibility for Khater safety on prison authorities and called for her immediate release. On Monday night, Israeli occupation forces “violently stormed our house, terrorised our children and arrested Lama,” he husband Hazem Al-Fakhouri said, noting that she suffers from anaemia and need daily iron tablets. He stressed that her continued detention could put her life in jeopardy. Occupation forces had previously tried to arrest Khater when, two years ago, they stormed her house. However she refused to leave her new born son and was instead summond for questioning and later released. Khater is a famous journalist known for her opinion pieces which disclose the Israeli occupation’s crimes and details of the security cooperation between Israel and the Palestinian Authority. The World Bank on Tuesday recommended the allocation of a $90 million grant to strengthen private sector capabilities as well as finance infrastructure projects in the occupied Palestinian territories particularly the Gaza Strip. “In response to an increasingly difficult situation, the World Bank’s Board recommended today the allocation of US$90 million to accelerate much-needed economic welfare for the Palestinian people, an increase from its yearly disbursement of US$55 million. The funds, in the form of grants, will be transferred from the Bank’s own income to the dedicated Trust Fund for Gaza and West Bank,” the body said in a statement. “We recognise that the full potential of the economy will not be achieved without a political settlement. Yet, more can be done to support the well-being of the Palestinian people who have faced more than a decade of stagnant growth and stubbornly high unemployment,” he added. In its statement, the World Bank expressed concern about the economic situation in the Palestinian territories, where 30 per cent of the Palestinians are unemployed and half of Gaza’s population are without jobs. With a 43% unemployment rate, 40% of #Gaza‘s population live below the poverty line. Fatah should accept the Egyptian proposal for reconciliation with Hamas and lift its punitive measures against Gaza, leader of the Palestinian Front for the Liberation of Palestine (PFLP) inside Israeli jails Ahmad Sa’adat has said. In a letter published by the PFLP’s media office, Sa’adat called on Palestinian President Mahmoud Abbas to start a national dialogue and to commit to the outcomes of this dialogue regarding the national issue. He stressed on the importance to reactivate the leadership of the PLO in order to prepare for the elections and a unity national council that includes all the Palestinian factions based on the Beirut understandings reached in 2017. He also called for the PA and Fatah to lift the punitive measures imposed on the Palestinians in the Gaza Strip and to resume full payments of the prisoners’ salaries in Gaza. Sa’adat said that imposing partial or complete punishment on these prisoners and their families contradicts the announced position which rejects the American request to do so. Egypt has proposed a reconciliation plan which Hamas accepted last Thursday however Fatah is yet to reply. Israeli soldiers invaded, on Thursday at dawn, Tulkarem city and nearby Far’un village, searched homes and a car repair facility, and abducted three young men. Eyewitnesses said several army jeeps invaded the al-Aqsa neighborhood, in the northern part of Tulkarem city, searched homes and abducted Mohammad Qaffini. A large military force also invaded Far’un village, south of Tulkarem, searched a few homes, and abducted Monir Na’im ‘Adwan, 40, and his brother, Mohammad, 36. The soldiers also broke into and searched a car repair facility, owned by the two detained brothers. Dr. Ashraf al-Qedra, the spokesperson of the Health Ministry in the Gaza Strip, has confirmed that Israeli soldiers killed, on Wednesday evening, three Palestinians, and injured one, after the army fired artillery shells into several areas in central Gaza Strip, and east of Gaza city. Dr. al-Qedra said the three slain Palestinians have been identified as Ahmad Monir al-Basous, 28, ‘Abada As’ad Ferwana, 29, and Mohammad Tawfiq al-‘Ar’ir, 27; the three, from the Sheja’eyya neighborhood in Gaza, were killed by Israeli artillery shells east of the city. Dr. al-Qedra added that one Palestinian suffered moderate wounds in an Israeli bombardment of a site in northern Gaza, and was rushed to the Indonesian Hospital. 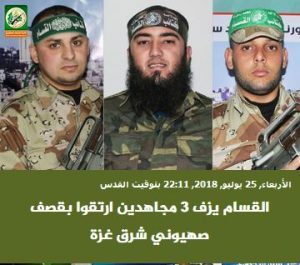 The Al-Qassam Brigades, the armed wing of Hamas, said in an official statement that the three fighters are members of the group, and vowed retaliation. p, in addition to an area east of the al-Maghazi refugee camp, also in central Gaza. The army also fired several shells at an observation post east of Gaza city, causing excessive damage. On Wednesday night, as Israeli artillery shells and drones began pounding eastern Gaza, Palestinian resistance groups reportedly fired back, wounding two Israeli soldiers. Some Israeli media sources claimed that the Palestinian resistance fired first, but live streams posted by Palestinians on Twitter and Facebook show that the drone strikes preceded the reports of Palestinians shooting toward the Israeli military base in eastern Gaza. 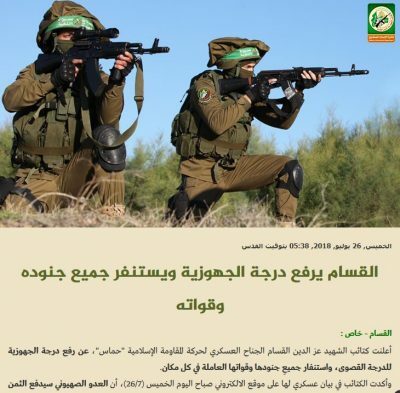 Israeli daily Haaretz has reported that the army believes some armed groups, not affiliated with Hamas, are responsible for sniper fire against the soldiers near the border fence. It added that the soldiers exchanged fire with Hamas fighters, on Wednesday evening, when the soldiers reportedly tried to remove Palestinian youngsters from the fence area, and said that the soldiers were then targeted with sniper fire. On Tuesday, the Health Ministry has confirmed, Tuesday, that Majd Soheil Mohammad ‘Oqeil, 26, died from serious wounds her suffered, on May 14th, after Israeli soldiers shot him with live fire in northern Gaza. Over the past hundred days, Israeli forces have killed 147 Palestinians, and wounded more than 17,000 participating in non-violent protests at or near the parameter fence in Gaza. No Israelis were killed in Gaza until this past Friday, when Israeli bombs killed two Palestinian children, and Palestinian fighters fired at an Israeli military base with gunfire, killing one soldier. Four Palestinian fighters were killed in that exchange of fire. Later that night, Israeli forces dropped more than two dozen bombs on the Gaza Strip, then negotiated a ceasefire through Egyptian mediators. Despite a ceasefire established Saturday between Israel and Palestinian resistance groups, Israel has continued its bombing campaign against the Gaza Strip, with four Palestinians reportedly killed in eastern Gaza Wednesday night. No Palestinian shells have been fired toward Israel since the ceasefire, despite continued Israeli violations. On Wednesday night, as Israeli artillery shells and drones began pounding eastern Gaza, Palestinian resistance groups reportedly fired back, wounding two Israeli soldiers. Some Israeli media sources claimed that the Palestinian resistance fired first, but live streams posted by Palestinians on Twitter and Facebook show that the drone strikes preceded the reports of Palestinians shooting toward the Israeli military base in eastern Gaza. 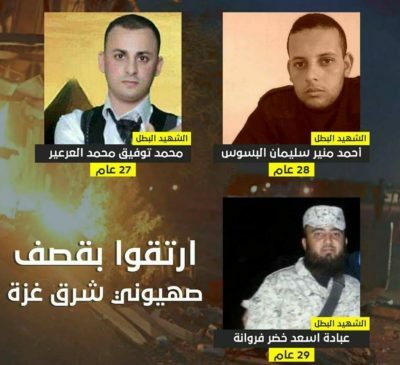 Some local media sources have reported that four Palestinians were killed, identifying them as Obada Al-Farwana, Taha Hararah, Ahmad Albassous, and Tawfiq Alwadia. But other local sources, including Al-Quds News, say that three were killed and one was critically injured. In addition to those killed, a number of Palestinians were reportedly injured by Israeli artillery fire and drone strikes. This follows a drone strike by Israeli forces on Wednesday which wounded three Palestinians. Over the past hundred days, Israeli forces have killed 147 Palestinians, and wounded more than 17,000 participating in non-violent protests at the border between Gaza and Israel. No Israelis were killed in Gaza until this past Friday, when Israeli bombs killed two Palestinian children, and Palestinian fighters fired at an Israeli military base with gunfire, killing one soldier. Four Palestinian fighters were killed in that exchange of fire. Later that night, Israeli forces dropped more than two dozen bombs on the Gaza Strip, then negotiated a ceasefire through Egyptian mediators. Israeli forces continued with systematic crimes in the occupied Palestinian territory (oPt) for the week of 19 – 25 July, 2018. Israeli forces continued to use excessive force against Palestinian protesters in the Gaza Strip. A Palestinian civilian was killed and 2 civilians succumbed to their previous wounds. 99 Palestinian civilians, including 23 children, a woman, a male journalist, and a female journalist, were wounded; 3 of them sustained serious wounds. Israeli forces continued to use lethal force against Palestinian civilians, who participated in peaceful demonstrations organized within the activities of the “Great March of Return and Breaking the Siege” in the Gaza Strip, which witnessed for the 17th week in a row peaceful demonstrations along the eastern and northern Gaza Strip border area. During the reporting period in the Gaza Strip, the Israeli forces killed a Palestinian civilian while 2 civilians succumbed to their previous wounds. Moreover, the Israeli forces wounded 124 others, including 30 children, 4 women, a male journalist, and a female journalist. 3 of those wounded sustained serious wounds. In the West Bank, the Israeli forces killed a Palestinian civilian and wounded 5 others, including 2 children. 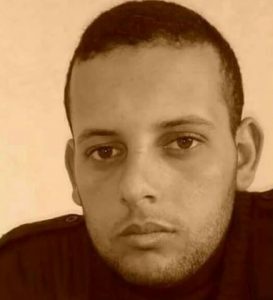 In the Gaza Strip, on 20 July 2018, Israeli forces killed Mohammed Sharif ‘Abed Badwan (23), from al-Zaytoun neighborhood, east of Gaza City, while participating with thousands of protestors in the Return and Breaking Siege March, east of Malakah square , east of al-Zaytoun neighborhood, east of Gaza City. Mohamed was hit with a live bullet to the chest. Return and Breaking Siege March in Khuza’ah village. Karam’s wounds were described as critical and he was then admitted to the Intensive Care Unit ICU and stayed there until his death was announced. On 24 July 2018, medical sources at the Indonesian Hospital in Jabalia in the northern Gaza Strip announced the death of Majd Suhail Mohammed ‘Aqeel (26) from al-Sekkah Street in Jabalia succumbing to wounds he sustained on 14 May 2018, during his participation in the March of Return and Breaking Siege. 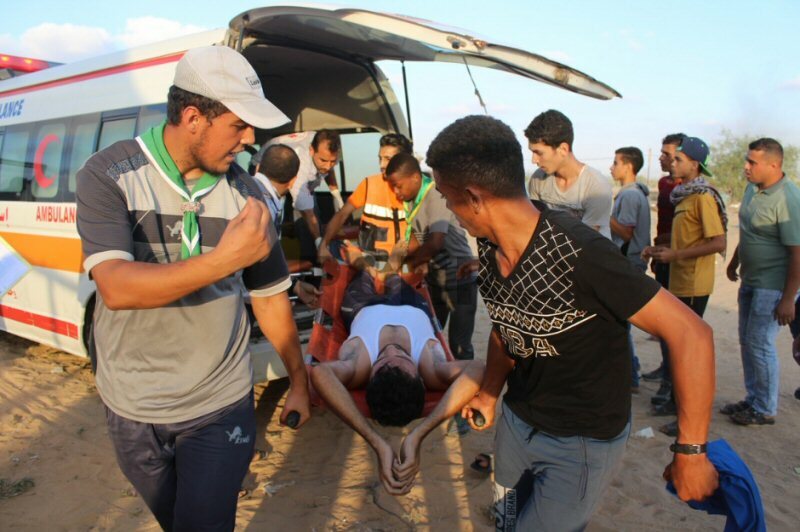 During the reporting period, while using the excessive force against the peaceful protesters along the Gaza Strip borders, the Israeli forces wounded 99 Palestinian civilians, including 23 children, a woman, a male journalist, and a female journalist. 3 of those wounded sustained serious wounds. As part of targeting the border areas, during the reporting period, Israeli forces fired 19 artillery shells along the eastern borders of the Gaza Strip with Israel. As part of the airstrikes, Israeli warplanes launched 23 air raids targeting a group of Palestinian civilians, claiming that they fired incendiary balloons; military sites belonging to Palestinian resistance groups; and empty lands. The Israeli warplanes fired 46 missiles resulted in the wounding of 25 civilians, including 7 children and 3 women. Moreover, 7 Palestinian officers in the Gaza Interior Ministry were killed. An air raid resulted in the death of 54 sheep, 60 doves and 160 chickens, in addition to damaging tools used for breeding livestock in a farm belonging to Majed al-Shaiekh. The abovementioned farm is located in the eastern borders, adjacent to al-Hajjah Handah Street, east of al-Shuja’iyia neighborhood, east of Gaza City. Moreover, al-Nakheel Resort, west of al-Buriej Camp in the centre of the Gaza Strip, sustained partial damages after targeting it. As part of targeting Palestinian fishermen in the Gaza Sea, the Israeli forces continued to escalate their attacks against the Palestinian fishermen, pointing out to the ongoing Israeli policy of targeting their livelihoods. During the reporting period, PCHR documented 4 shooting incidents at the fishermen, including 3 in the northern Gaza Strip and 1 in the southern Gaza Strip. In the West Bank, on 23 July 2018, in new crime of excessive use of lethal force against Palestinian civilians, Israeli forces killed Arkan Mizher (15) and wounded another one in al-Dahish refugee camp, south of Bethlehem. Arkan was hit with a live bullet that entered his heart and exited his back. Further to the above mentioned wounded person, during the reporting period, Israeli forces wounded 5 civilians, including 2 children. During the reporting period, Israeli forces conducted at least 64 military incursions into Palestinian communities in the West Bank and 6 similar ones into Jerusalem and its suburbs. During those incursions, Israeli forces arrested at least 46 Palestinians, including a child and a woman, in the West Bank. Meanwhile, 13 other civilians, including 2 children and 2 women, were arrested in Jerusalem and its suburbs. In the Gaza Strip, on 19 July 2018, Israeli forces moved into al-Shawka village, east of Rafah, south of the Gaza Strip. They levelled lands and repaired border fence and barbed wire before re-deploying along the border fence between the Gaza Strip and Israel. As part of demolishing houses and civilian facilities, on 19 July 2018, Israeli forces ordered al-Shawamrah and Abu Irmilah families to demolish 4 apartments in al-Ashqariyia neighborhood in Beit Haninah village, north of occupied East Jerusalem, as an implementation to the Israeli Supreme Court’s decision. The Israeli Supreme Court claimed that the ownership of the plot of land, where the apartments were established, belongs to Israeli settlers from 1974. The two families built the abovementioned apartments on an area of 1.5 dunums in 2000. Al-Shawamrah and Abu Irmilah families bought the 3-dunum plot of land from a Jerusalemite family before resorting to the courts to protect the plot of land and property built on it. The two families self-demolished their houses, which cost NIS 30.000, and set up a tent sheltering 30 members, half of them were children. On 25 July 2018, Israeli bulldozers demolished a kindergarten and a woman center in “ al-Baba Mount” Bedouin Community, southeast of occupied East Jerusalem, under the pretext of non-licensing. The 60-square-meter kindergarten was comprised of mobile houses (caravan) built of tin plates and donated by the EU for the village residents 2 months ago. The kindergarten was serving around 28 children. It should be noted that here is around 56 families are living in the community. On 22 July 2018, the Israeli police secured hundreds of Israeli settlers while raiding al-Aqsa Mosque yards in occupied East Jerusalem’s Old City, on the anniversary of so-called “Temple Destruction”. The Islamic Endowment (Awqaf) Department said that the Israeli forces imposed a military cordon on al-Aqsa Mosque’s gates and obstructed the worshipers’ movement. Eyewitnesses said that the Israeli settlers attacked Palestinian civilians, journalists and traders in al-Qataneen Market right, which is located near al-Aqsa Mosque. The settlers also raided and searched some shops and damaged their contents under the Israeli police’ protection. At approximately 16:00 on Friday 20 July 2018, thousands of civilians swarmed to the Return encampments established by the Supreme National Authority for the Great March of Return and Breaking Siege, east of Malakah intersection, east of al-Zaytoun neighborhood, east of Gaza City in the 17th consecutive Friday titled “The UNRWA conspiracy will not pass on refugees.” The activities included raising flags, chanting national slogans, setting fire to tires and flying kites. Though the demonstrations were fully peaceful, Israeli forces stationed behind the border fence between the Gaza Strip and Israel deliberately and randomly fired live and rubber bullets and tear gas canisters at them. As a result, Mohammed Sharif Abed Badwan (23), from al-Zaytoun neighborhood, east of Gaza City, was killed after being hit with a live bullet to the chest. Moreover, 35 civilians, including 3 children and a woman, were hit with live bullets and its shrapnel and tear gas canisters. Around the same time, hundreds of Palestinians swarmed to the Return encampments, east of Khuza’ah village, east of Khan Younis in the southern Gaza Strip to participate in the demonstrations organized by Supreme National Authority for the Great March of Return and Breaking Siege. The number of protestors increased at approximately 16:30, as the participants gathered inside and outside the encampment’s yard and raised flags, chanted national slogans and flew dozens of kites and balloons as dozens of them, including women and children, approached the border fence between the Gaza Strip and Israel and set fire. A number of them attempted to throw stones at Israeli forces and remove the barbed wire fence established by those forces on the Palestinian lands 30-50 meters away from the main border fence. The Israeli forces stationed behind hills, sand barriers, military vehicles and their vicinity sporadically opened fire and fired tear gas canisters at the protestors and at the area behind them. An Israeli tank arrived at the area and stationed adjacent to the protestors in Khuza’ah, east of Khan Younis, and opened fire at the protestors a doctors classified a civilian’s injury as serious. At approximately 18:10, the shooting, which continued until approximately 20:00. As a result, 10 civilians, including 2 children and a female journalist, were hit with live bullets and tear gas canisters. The wounded journalist identified as Heba Sami Mohammed ‘Awad (21), from Khan Younis and works at PalHadath Agency, was hit with a tear gas canister to the left hand as she was wearing a Vest Clearly Marked Press. The wounded civilians were taken to the field hospital and then transferred to Nasser, Gaza European and Algerian Hospitals. Moreover, dozens of civilians suffered tear gas inhalation. Some of them received medical treatment on the spot or in the field hospital while others were transferred to hospitals to receive medical treatment due to suffering from tear gas inhalation and seizures. Around the same time, hundreds of civilians swarmed to the Return encampments established by the Supreme National Authority for the Great March of Return and Breaking Siege, 400 meters away from the border fence between the Gaza Strip and Israel, east of al-Buraij in the central Gaza Strip. Dozens of young men, children and women approached the border fence, set fire to tires and threw stones at Israeli soldiers stationed behind sand barriers along the border fence. The Israeli forces fired live bullets and tear gas canisters at the participants. The clashes continued until approximately 20:00 on the same day. As a result, 14 civilians, including 2 children, were wounded. Twelve of them were hit with live bullets and 2 others were hit with tear gas canisters. The wounded civilians were taken via ambulances belonging to Palestine Red Crescent Society (PRCS) to al-Aqsa Hospital in Deir al-Balah. Doctors classified a civilian’s injury as serious and he was then transferred him to al-Shifa Hospital in Gaza City. The injuries of the other wounded civilians were classified between minor and moderate. At approximately 17:00, hundreds of Palestinian swarmed to the Return encampments established by the Supreme National Authority for the Great March of Return, east of Abu Safiyah Hill, northeast of Jabalia in the northern Gaza Strip. The protestors raised Palestinian flags, chanted national slogans and set fire to tires. Dozens of them approached the border fence between the Gaza Strip and Israel and threw stones at Israeli soldiers stationed behind the border fence. The Israeli forces deliberately and randomly fired live and rubber bullets and tear gas canisters at them. The clashes continued until approximately 21:00 on the same day. As a result, 18 civilians, including 8 children, were wounded. Seven of them were hit with live bullets and its shrapnel while 11 were hit with tear gas canisters. The wounded civilians were transferred via ambulances belonging to PRCS, Medical Services and the Ministry of Health to the Indonesian and al-Awda Hospitals. Doctors classified the injury of a civilian as serious. Around the same time, thousands of civilians swarmed to the Return encampment established by the Supreme National Authority for the Great March of Return and Breaking Siege, 300 meters away from the border fence between the Gaza Strip and Israel, east of al-Shawkah village, east of Rafah in the southern Gaza Strip. A number of young men approached the border fence, flew kites, set fire to tires and threw stones at Israeli soldiers stationed behind the border fence. The soldiers fired live bullets and tear gas canisters at the protestors. The clashes continued until approximately 20:00. As a result, 15 civilians, including 7 children, a woman and a journalist, were wounded. Ten of them were hit with live bullets and its shrapnel and 5 were hit with tear gas canisters. Among the wounded was Zaki Yahiya Zaki ‘Awadallah (27), a journalists at One Media Network, was hit with an explosive live bullet to the legs. The wounded civilians were taken to the field hospital in the Return camp and then transferred to Abu Yusuf al-Najjar hospital in Rafah. Doctors classified their injuries as moderate. At approximately 16:00 on Sunday, 22 July 2018, dozens of children and young men gathered near the border fence between the Gaza Strip and Israel, east of al-Buraij in the central Gaza Strip, to participate in the Return March and Breaking the Siege. They threw stones at Israeli soldiers stationed behind sand barriers along the border fence. The soldiers fired live bullets and tear gas canisters. The clashes continued until approximately 20:00 on the same day. As a result, an 18-year-old civilian was hit with a live bullet to the lower limbs. The wounded civilian was transferred via a PRCS ambulance to al-Aqsa Hospital in Deir al-Balah and doctors classified his injury as moderate. At approximately 12:05 on Monday, 23 July 2018, Israeli forces stationed behind the border fence between the Gaza Strip and Israel, east of al-Shuhada’a Islamic Cemetery, east of Jabalia in the northern Gaza Strip, opened fire at a group of Palestinian civilians participating in the demonstrations as they approached the border fence. As a result, a 15-year-old civilian, from al-Sheja’eya neighborhood in Gaza City, was hit with a live bullet to the right leg. He was transferred to the Indonesian Hospital and doctors classified his injury as moderate. At approximately 11:30 on Tuesday, 24 July 2018, Israeli forces stationed behind the border fence between the Gaza Strip and Israel, east of al-Shuhada’a Islamic Cemetery, east of Jabalia in the northern Gaza Strip, opened fire at a group of Palestinian civilians participating in the March Return activates as they approached the border fence. As a result, a 23-year-old civilian, from Tal al-Hawa neighborhood in Gaza City, was hit with a live bullet to the left thigh, causing a cut to the tendons and fracture to the thigh bone. The wounded civilian was taken to the Indonesian Hospital and doctors classified his injury as moderate. At approximately 00:48 on Monday, 23 July 2018, medical sources at the European hospital in Khan Younis in the southern Gaza Strip, announced the death of Karam Ibrahim ‘Ali ‘Arafat (26) from ‘Abasan al-Jadidah, east of the city, succumbing to his previous wounds. According to PCHR’s investigations, ‘Arafat was wounded on 08 June 2018, after being hit with a tear gas canister to the head during his participation in the March of Return and Breaking Siege in Khuza’ah village. It should be noted that the Israeli forces’ opening fire on the same day caused the killing of Ziyad al-Braim (28) and wounding 11 civilians, including ‘Arafat, whose injury was classified as serious. ‘Arafat stayed in the Intensive Care Unit (ICU) until his death was announced. 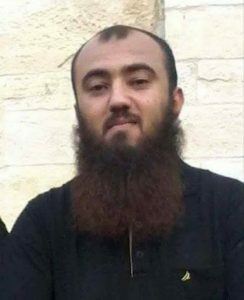 At approximately 11:45 on Tuesday, 24 July 2018, medical sources at the Indonesian Hospital in Jabalia in the northern Gaza Strip announced the death of Majd Suhail Mohammed ‘Aqeel (26) from al-Sekkah Street in Jabalia succumbing to wounds he sustained during his participation in the March of Return and Breaking Siege. According to PCHR’s investigations, Majd was wounded on 14 May 2017 in the clashes that erupted on the anniversary the Palestinian Nakbah Day, east of Abu Safiyah Hill, northeast of Jabalia, as he was hit with a live bullet to the thighs, cutting the main vein. Majd was taken to the Indonesian Hospital. On 21 May 2018, he was then transferred al-Mutala’ Hospital in Jerusalem. Majd returned from al-Mutala’ Hospital to the Indonesian Hospital on 05 July 2018, and he stayed in the ICU section until his death was announced. At approximately 13:40 on Friday, 20 July 2018, a group of Palestinian civilians moved from Kufor Qaddoum village, northeast of Qalqiliyah, to the eastern entrance to the village, which has been closed for 15 years in favor of the entrance to “Kedumim” settlement established on the village lands. The protestors chanted national slogans demanding end of occupation, condemning the U.S President Donald Trump’s decision to recognize Jerusalem as the capital of Israel and condemning the Israeli forces’ crimes against Palestinian protestors along the eastern border of the Gaza Strip within “The Great March of Return and Breaking the Siege” activities. Several representatives of national factions and representatives of National Action Factions in the north of the West Bank and a number of foreign and Israeli activists. Israeli soldiers suppressed the demonstration and fired live and rubber bullets, sound bombs and tear gas canisters at them. As a result, 3 civilians, including a 13-year-old child, was hit with a live bullet shrapnel to the left hand. Following the end of Friday prayer, dozens of Palestinian civilians and Israeli and international human rights defenders organized protests condemning the annexation wall, settlement activity and the U.S President Donald Trump’s decision relevant to Jerusalem in Bil’in and Ni’lin villages, west of Ramallah and al-Nabi Saleh, northwest of the City. The Israeli forces used force to disperse the protestors by firing live and rubber bullets, sound bombs and tear gas canisters at them. The soldiers also chased them into olive fields and between houses. As a result, many protestors suffered tear gas inhalation, but neither casualties nor arrests were reported. Mowafaq ‘Amirah, a reporter at Palestine TV Channel from Ni’lin village, said to PCHR’s fieldworker that on Thursday, 19 July 2018, the Israeli forces established a military checkpoint at the village entrance. The soldiers distributed leaflets on civilians who were inside their civilian vehicles and fixed some on houses’ walls and shops that are near the village entrance. The leaflet included a threat from the Israeli forces to the village residents if they organized demonstrations. At approximately 14:00 on the same day, a number of Palestinian youngsters gathered in the vicinity of a Military Checkpoint (56) established at the entrance to al-Shuhada’a Street in the center of Hebron and threw stones at the checkpoint. Israeli soldiers deployed in al-Zawiyah Gate area and fired sound bombs and tear gas canisters at the stone throwers. The soldiers also chased them between shops. As a result, a number of civilians suffered tear gas inhalation. The children continued throwing stones at the soldiers, who fired rubber bullets at them. As a result, a 14-year-old child was hit with a rubber bullet to the face. The child was transferred via a PRCS ambulance to Hebron Governmental Hospital to receive medical treatment. Doctors classified his injury as moderate. At approximately 01:00 on Sunday, 22 July 2018, Israeli forces moved into manu neighborhoods in occupied East Jerusalem’s Old City. They raided and searched houses, from which they arrested Jihad Naser Qaws (24), Mohamed al-Dabbagh and Rohi al-Kalghasi. At approximately 01:30, Israeli forces moved into Hizmah village, northeast of occupied East Jerusalem. They raided and searched a house belonging to Sa’d Sayil al-Qadi (20) and then arrested him. At approximately 02:00, Israeli forces moved into Ras al-‘Amoud neighborhood, east of occupied East Jerusalem. 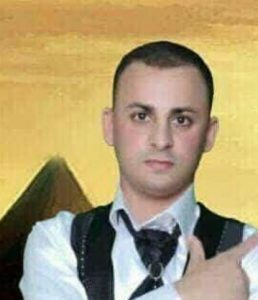 They raided and searched a house belonging to a former prisoner ‘Amr Bassam Abu ‘Arafah (30) and arrested him. At approximately 02:30 on Sunday, 22 July 2018, Israeli forces moved into Wadi Qaddoum neighborhood in Silwan village, south of occupied East Jerusalem’s Old City. They raided and searched a house belonging to a former prisoner Ma’moun Mohamed al-Razim (43) and then arrested him. At approximately 04:30 on Sunday, Israeli forces moved into al-Sawanah neighborhood, east of occupied East Jerusalem’s Old City. They raided and searched a house belonging to a former prisoner Hanadi al-Helwani (38) and then arrested her. Hanadi was then taken to an investigation center for interrogation and was released on the same day evening. At approximately 02:30 on Tuesday, 24 July 2018, Israeli forces moved into al-‘Issawiyia village, northeast of occupied East Jerusalem. They raided and searched a house belonging to Waseem Naiyf ‘Obaid (40) and then arrested him along with his wife Ibtisam ‘Obaid (35). Waseem and his wife were then taken to a detention facility in occupied Jerusalem. 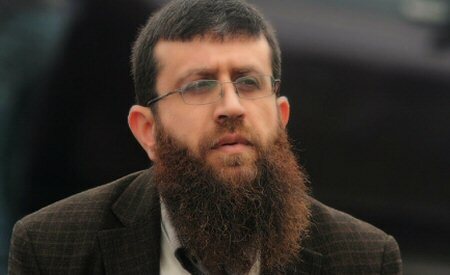 Mohamed Abu al-Humus, Member of the Follow-up Committee in -‘Issawiyia village, said that the Israeli forces accompanied with Israeli Intelligence officers moved into the village and arrested Ibtisam ‘Obaid and her husband Waseem under the pretext of illegally entering Jerusalem and because Ibtisam holds the West Bank ID. Ibtisam was taken to Salah al-Deen Station and then to ‘Ofer Prison, southwest of Ramallah. 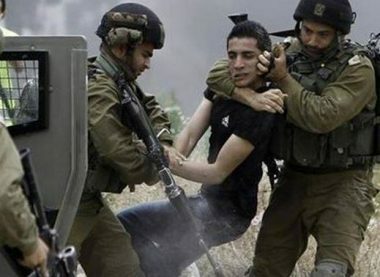 Abu al-Humus added the Israeli police released Waseem after detaining and interrogating him for few hours. They also asked him about staying his wife in the house and considered it as a violation of law because she did not have a permit. It should be noted that the Israeli authorities deported Ibtisam from Jerusalem in last March, noting that she lives in Jerusalem from 16 years with her husband and their children. During the past years, Ibtisam attempted to get an ID or a residency from the competent Israeli bodies, but in vain under the pretext of “security refusal”. On Thursday, 19 July 2018, Israeli forces ordered al-Shawamrah and Abu Irmilah families to demolish 4 apartments in al-Ashqariyia neighborhood in Beit Haninah village, north of occupied East Jerusalem, as an implementation to the Israeli Supreme Court’s decision. The Israeli Supreme Court claimed that the ownership of the plot of land, where the apartments were established, belongs to Israeli settlers from 1974. According to PCHR’s investigations, Rohi Abu Irmilah and Jehad Shawamrah built the abovementioned apartments on an area of 1.5 dunums in 2000. Al-Shawamrah and Abu Irmilah families bought the 3-dunum plot of land from a Jerusalemite family before resorting to the courts to protect the plot of land and property built on it. At the beginning, the court’s decision came in favor of the 2 families, but a settlement association then appealed the court’s decision in 2013 and submitted papers that proved its ownership to the land. The two families said that the papers submitted by the settlement association are counterfeit. The Israeli Supreme Court issued a decision that grants the land’s ownership to Israeli settlers. The families preferred to self-demolish their houses instead of leaving them for the Israeli settlers or taking compensations and for fear of transferring their apartments to settlement outposts. On Thursday morning, the two families self-demolished their houses, which cost NIS 30.000, and set up a tent sheltering 30 members, half of them were children. Jehad al-Shawarmah, one of the apartments’ owners, said that after building the apartments in 2000, the Israeli Municipality imposed financial fines on them under the pretext of non-licensing. After that, the families attempted to license the apartments and got an initial approval for licensing, but the Israeli settlers then claimed their ownership of the land from 2006. Jehad also said that an Israeli settler, Aryeh King, asked them through his lawyer for the land and paid a rent allowance for using it in the past years. After heading to courts, the judges proved ownership of the land to the Palestinians living in the house, but the settler demanded the land again. The Magistrate Court closed the case file in favor of the Palestinians while the Israeli settler headed to the District Court in order to appeal the case and submitted counterfeit documents, which claim that the Israeli settlers own the land. The District Court then issued a decision that grants the land’s ownership to Israeli settlers and the Israeli Supreme Court confirmed this decision. Jehad added that his family refused the Israeli forces’ bargaining and said: “we refuse to give our houses to the Israeli settlers”. It should be noted that the abovementioned apartments were sheltering 30 members, most of them were children, and now they are living in 2 tents established on nearby land, because rent prices are high in Jerusalem. At approximately 08:00 on Wednesday, 25 July 2018, Israeli bulldozers demolished a kindergarten and a woman center in “ al-Baba Mount” Bedouin Community, southeast of occupied East Jerusalem, under the pretext of non-licensing. ‘Atallah Mazar’a, Representative of al-Baba Mount Bedouin Community, said that the Israeli Civil Administration staff accompanied with bulldozers moved into al-Baba Mount Bedouin Community without a prior warning, under the Israeli forces’ protection. The Israeli bulldozers demolished the only kindergarten in the community and the woman center without allowing the residents to approach. He also said that the 60-square-meter kindergarten was comprised of mobile houses (caravan) built of tin plates and donated by the EU for the village residents 2 months ago. The kindergarten was serving around 28 children. ‘Atallah clarified that it was not the first time that the Israeli Civil Administration demolish the houses of al-Baba Mount Bedouin Community. It should be noted that here is around 56 families are living in the community. On 04 July 2018, Israeli forces demolished 10 dwellings and 9 barracks used for breeding livestock in Abu Nawar Bedouin Community near al-‘Izariyia village, east of occupied East Jerusalem. As a result, around 60 Palestinian civilians became homeless. It should be noted that the residents of Khan al-Ahmar Community got a precautionary order to stop demolishing the community until the middle of next month. These measures imposed on Khan al-Ahmar Community residents are a prelude to expel its residents within project “E1”, which is a settlement project targeted around 12.000 dunums of East Jerusalem and the West Bank lands in favor of Israeli projects serving Israeli settlers. The“E1” project also aims at separating occupied Jerusalem from the West Bank and emptying the area from any Palestinian residents as part of project to separate south of the West Bank from its center and isolate occupied East Jerusalem from the West Bank. On Sunday morning, 22 July 2018, Israeli police and special Israeli forces provided protection for hundreds of settlers while raiding al-Aqsa Mosque yards in occupied East Jerusalem’s Old City, on the anniversary of so-called “Temple Destruction”. The Islamic Endowment(Awqaf) Department said that around 1336 Israeli settlers raided al-Aqsa Mosque as groups from Al-Maghariba Gate. The Islamic Endowment Department stated that the Israeli settlers performed rituals and Talmudic prayers in the mosque’s yards, under the protection of hundreds of Israeli forces and armed Special Forces, who imposed a military cordon on al-Aqsa Mosque’s gates and obstructed the worshipers’ movement. The storming of al-Aqsa Mosque came in the framework of invitations by Jewish organizations via their websites and media channels within unprecedented jewish majority program. This program aims at doubling the number of settlers, who raid al-Aqsa Mosque on the anniversary of the so-called “Temple’s Destruction”. These invitations received great support and encouragement from the Israeli Government, which endeavors to change the historical and legal situation of al-Aqsa Mosque. Feras El-Debs, Head of Media and Public Relation Department in the Islamic Endowments (Awqaf), said that raiding of al-Aqsa Mosque usually happens by entering another group of settlers after exiting the first one from al-Aqsa Mosque, but the Israeli forces allowed all groups to raid the mosque together without waiting for the first to exit al-Selselah Gate. He also said that the Israeli police deliberately imposed restrictions on al-Aqsa Mosque’s worshipers and guards and attacked some of them. He emphasized that groups of Israeli settlers, who were performing prayers at al-Asbat Gate (Lions Gate), obstructed media interviews conducted with the Grand Mufti of Jerusalem and the Palestinian Territories, Sheikh Mohammed Huissen, and the Director of al-Aqsa Mosque, Omar Al-Keswani. According to PCHR’s fieldworker, few numbers of Palestinian worshipers, who were allowed to enter al-Aqsa Mosque, tried to confront the settlers’ raiding of al-Aqsa Mosque, but the Israeli police prevented them, chased them and threatened them to be arrested. The eyewitnesses also said that the Israeli police arrested Islam Bader Iskafi (14) from al-Aqsa Mosque while raising the Palestinian flag. They also arrested Hamza al-Nabulsi (15) while present in front of al-Asbat gate and Bassam Abu-Nab and Mohammed Abu-Nab while getting out of the mosque. Furthermore, the Israeli settlers attacked Palestinian civilians, journalists and traders in al-Qataneen Market right, which is located near al-Aqsa Mosque. They raided and searched some shops and damaged their contents under the Israeli police’ protection. It should be noted that on Saturday, 21 July 2018, the Israeli police closed with steel barriers many roads leading to Jerusalem and the Old City. The Israeli police also provocatively deployed police officer and special Israeli forces in the area to secure the settlers demonstrations, which started from the Old City and headed to al-Buraq Wall. At approximately 09:00 on Saturday, 21 July 2018, a group of Israeli settlers from “Susya” settlement, south of Yatta, south of Hebron, moved into Kherbit Susya established on the above-mentioned settlement’s lands and performed their religious rituals. The Israeli settlers cursed the village’s residents, who were present in the area, without any intervention of the Israeli forces. Al-Kherbah witnessed a large presence of the settlers during 3 days, causing fear among the residents. At approximately 11:00 on Sunday, 22 July 2018, Israeli forces closed Bab al-Zawiyiah area and Beer Sheva Street in the center of Hebron. They also ordered the shop’s owners to close and allowed Israeli settlers to access to an ancient building on Beer Sheva Street. The settlers performed their Talmudic rituals there, claiming that there was a Hebron grave and holy places for them. The Lift the Sanctions movement is echoing inside Israeli jails, as several leading Palestinian prisoners announced the launch of an open hunger strike on 25 July 2018 against PA sanctions policies against prisoners from Gaa. Representing a united front of all major Palestinian political parties within Israeli jails, the hunger strikers are demanding the reinstatement of aid and social support to Palestinian prisoners and their families from the Gaza Strip. As part of the Palestinian Authority in Ramallah’s sanctions on Gaza, which have included cuts to social benefits, delays in approval of medical treatment, cuts to electricity payments and other key issues that have affected the popular classes in the Strip, prisoners’ allowances, which are used to purchase goods at the “canteen” or prison store were also slashed or eliminated for Palestinian prisoners from Gaza, as were family support funds. Research has shown that prisoners are economically exploited and pay artificially high prices for food and other items. Palestinian prisoners’ families also rely on these social benefits, as their imprisoned family members are denied the opportunity to work to support their wives, children and parents. The Palestinian prisoners’ movement is a moral and political beacon for the Palestinian liberation struggle, and attacks on the well-being of Palestinian prisoners are particularly appalling in this context. It should also be noted that the severance of such payments is a key demand of Israel and the United States, and supporters of Israeli colonization and apartheid have engaged in heavy lobbying on an international level in an attempt to cut all support for Palestinian prisoners. Of course, the particular targeting of Palestinian prisoners from Gaza, at the same time that PA officials swear to uphold support for prisoners and their families, comes hand in hand with the intensified Israeli siege on Gaza and the daily bombing of the Strip. The PA sanctions have tightened even as over 136 Palestinians from Gaza have been killed in peaceful, popular protests for the right of return and the breaking of the siege under the banner of the Great March of Return. In addition, the PA sanctions on Gaza cannot be separated from the policy of security coordination that sees it turn over information on Palestinian resistance to the Israeli occupation and imprison, interrogate and harass Palestinian community organizers. In cities throughout occupied Palestine, protesters have taken the streets to demand the lifting of PA sanctions, especially amid the worsening Israeli siege on Gaza. During those protests, they have faced at times violent repression from PA security forces. The policies have sparked anger especially as they coincide with intensified Israeli attacks. Fishermen’s fishing zone has been reduced once again to three nautical miles, commercial and trade crossings have been closed and the attempts to suppress Palestinian resistance through starvation and siege have only intensified. It is in this context that Palestinian protesters have made clear that the PA’s sanctions serve only to perpetuate and intensify the siege, in line with Israeli and U.S. policies. The prisoners’ movement issued a statement, noting that more prisoners will be joining the struggle in the coming days. The launch of the hunger strike came as imprisoned PFLP General Secretary Ahmad Sa’adatissued a call for unity from Ramon prison, calling for “popular unity and democracy” in the Palestine Liberation Organization, so that it can act as the “sole legitimate representative of the Palestinian people in all their political and social colors and in all locations.” He emphasized the need to activate the interim leadership of the PLO to plan for its reconstruction and a democratic election process as essential to reconciliation and national unity. Samidoun Palestinian Prisoner Solidarity Network stands with the hunger strikers and demands the lifting of the PA’s sanctions on Gaza and Palestinians from Gaza, inside and outside Israeli jails. We join with the Palestinian, Arab and international movement to break the siege on Gaza, from the Great Return Marches to the Freedom Flotilla sailing for justice for Palestine. After months of efforts to return the social support funds to the families of the Palestinian political prisoners from the Gaza Strip held in Israeli occupation prisons, and after we have seen that the only answer is to increase the injustice against these families, we are moving forward in the framework of progressive steps of protest. This includes the open hunger strike by a number of prisoners. Because those who are in the position of responsibility must be at the forefront of the struggle and put their flesh and blood on the line for those who have entrusted them with the duties of leadership, so we take action in the prisoners’ movement today to strengthen our protest steps and raise the call for justice and confront the falsehoods about how these benefits have been prevented from reaching families. We in the prisoners’ movement affirm this escalation of our protest steps and vow that a greater number of prisoners will join the strike in the coming days if these rights are not returned to our families. This is, above all, a legitimate, legal and moral right and attempts to undermine it are an attack on the values of our Palestinian people and their unified consensus. We trust you, our people, that you will be our throats that will cry out on behalf of our absent voices. You will not perish, and your victories and struggles continue.